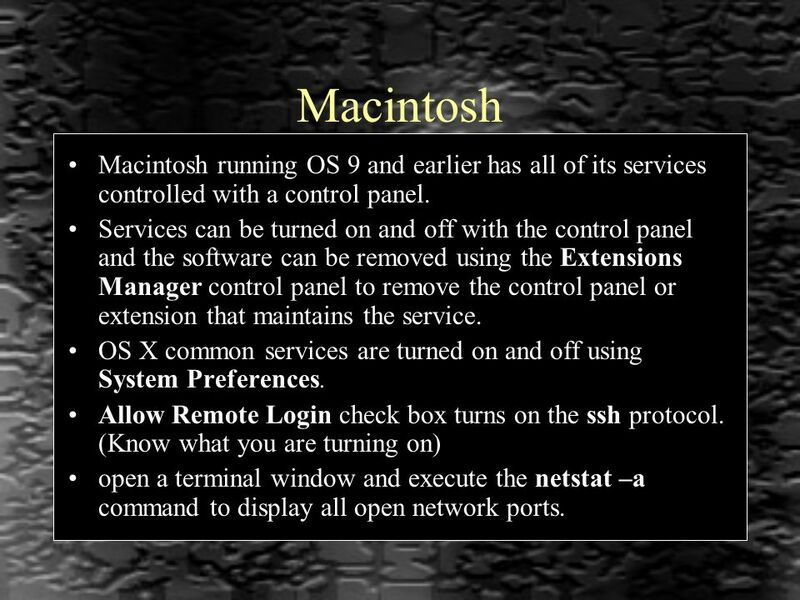 10 Macintosh Macintosh running OS 9 and earlier has all of its services controlled with a control panel. 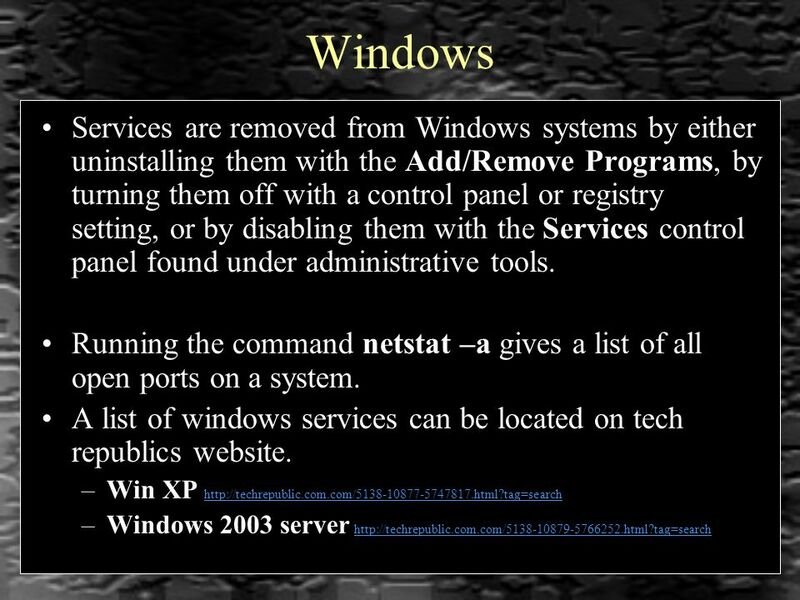 Services can be turned on and off with the control panel and the software can be removed using the Extensions Manager control panel to remove the control panel or extension that maintains the service. OS X common services are turned on and off using System Preferences. Allow Remote Login check box turns on the ssh protocol. 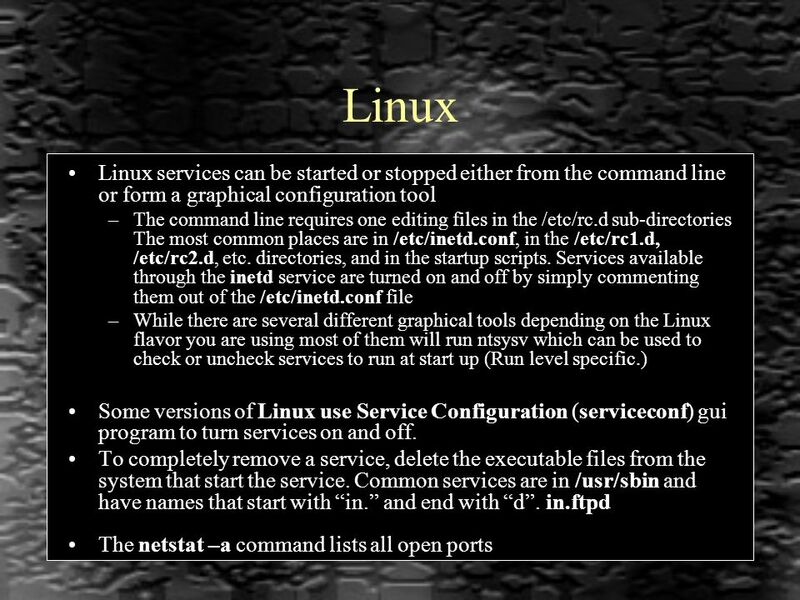 (Know what you are turning on) open a terminal window and execute the netstat –a command to display all open network ports. 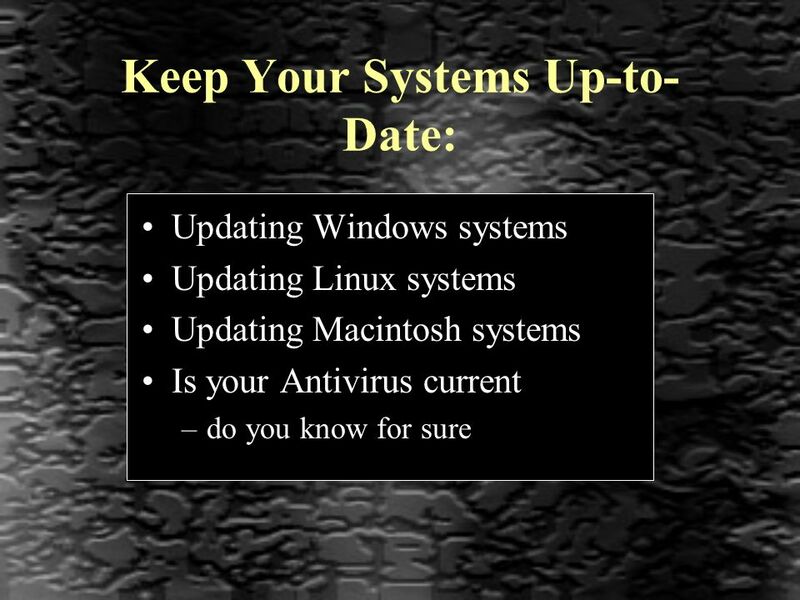 13 Updating Linux Systems Maintaining Linux systems is much like maintaining Windows systems in that there is an automatic update service available for most versions of Linux. 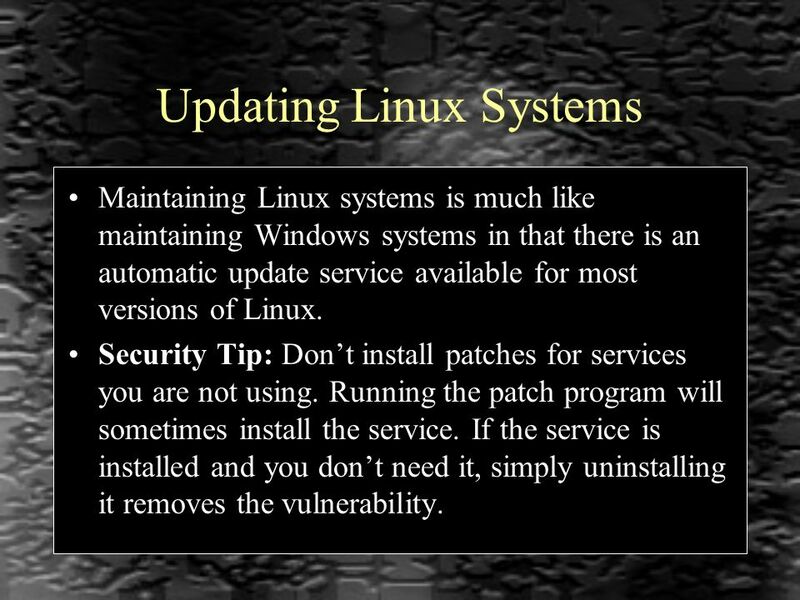 Security Tip: Dont install patches for services you are not using. Running the patch program will sometimes install the service. 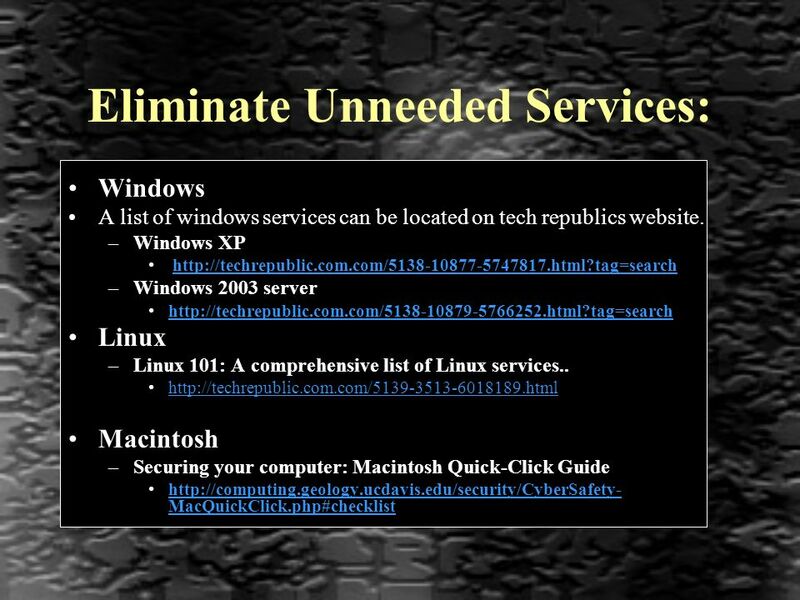 If the service is installed and you dont need it, simply uninstalling it removes the vulnerability. 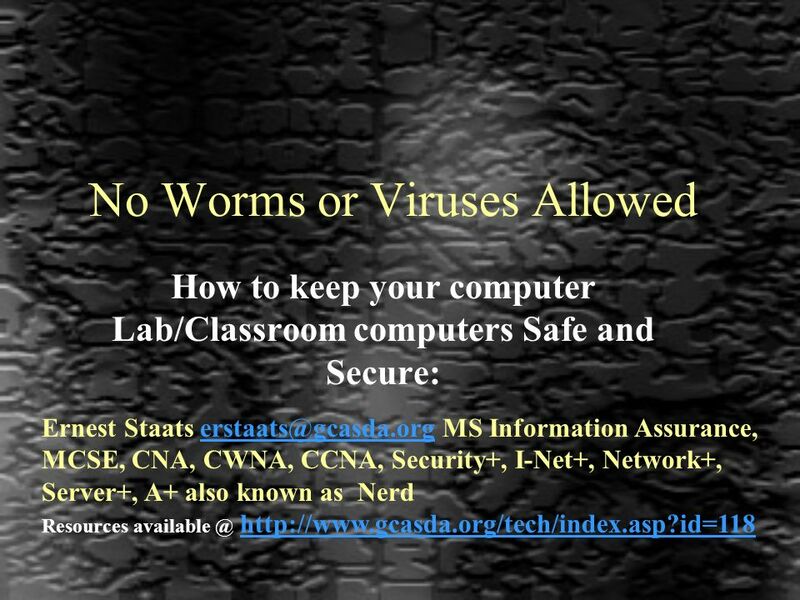 Download ppt "No Worms or Viruses Allowed How to keep your computer Lab/Classroom computers Safe and Secure: Ernest Staats MS Information Assurance,"
Keep Your PC Safe (Windows 7, Vista or XP) Nora Lucke 02/05/2012 Documents - security. 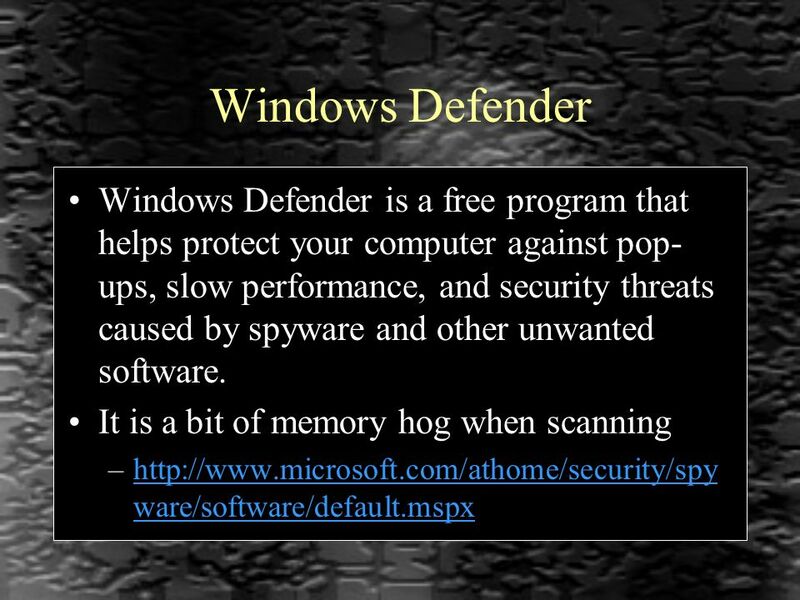 What is Spyware? Where did it come from?. 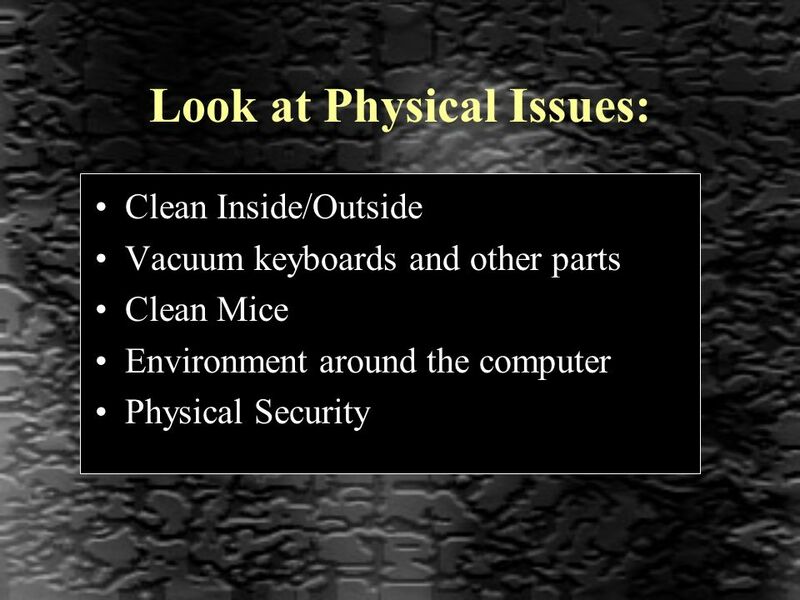 10 Things You Can do to Secure Your PC Presented by Peter Nowak OIS Client Services Manager. Configuring Windows Vista Security Lesson 8. 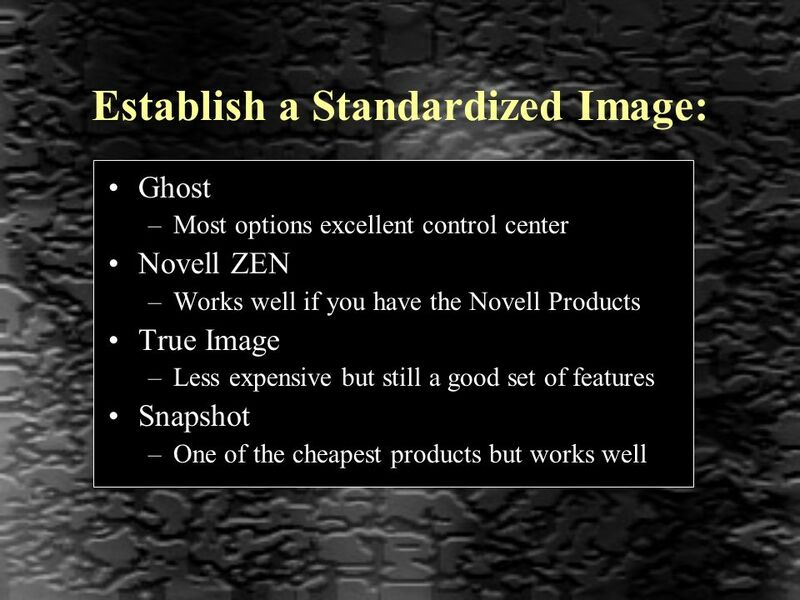 Skills Matrix Technology SkillObjective DomainObjective # Setting Up Users Configure and troubleshoot parental. 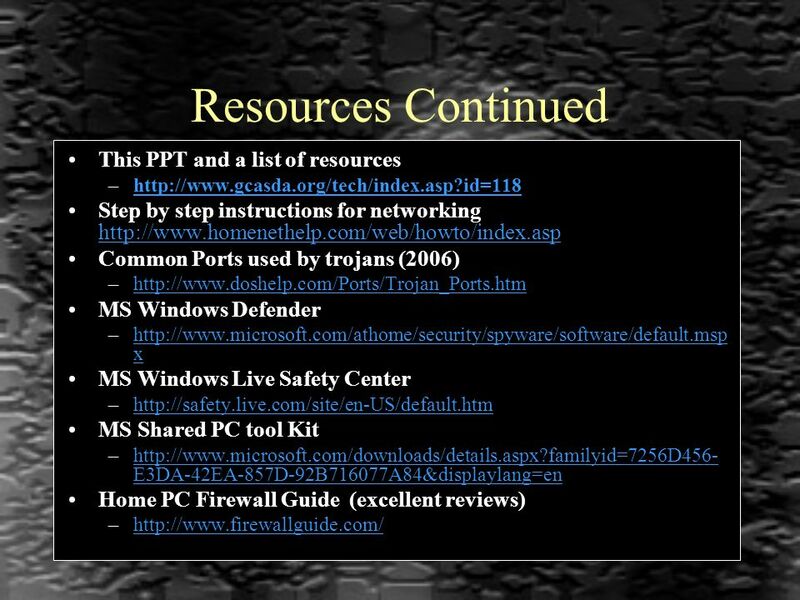 Telnet and FTP. 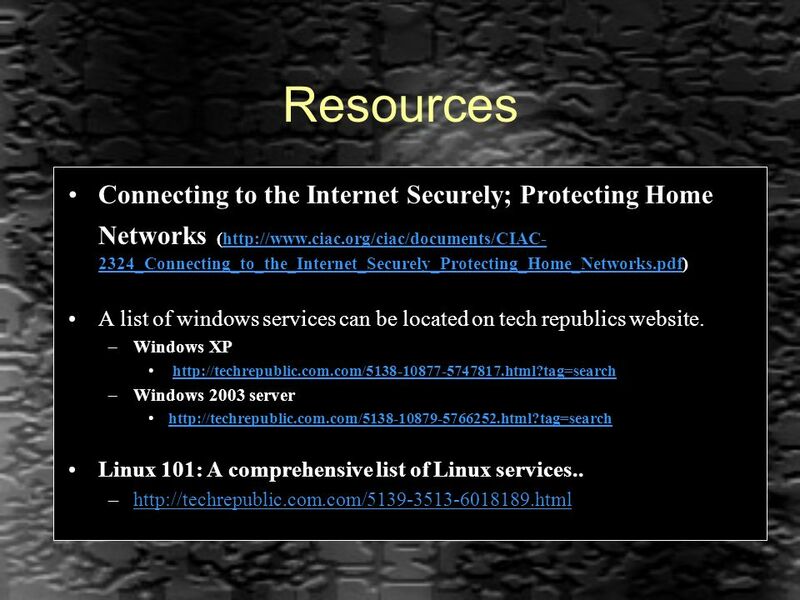 Telnet Lets you use the resources of some other computer on the Internet to access files, run programs, etc. Creates interactive connection. AVG 8.5 Product Line Welcome to a safe world …. | Page 2 Contents  Components Overview  Product Line Overview  AVG 8.0 Boxes. By Joshua T. I. Towers $13.3 billion was the direct cost of malware for business in 2006 “direct costs are defined as labor costs to analyze, repair. Exam ● On May 15, at 10:30am in this room ● Two hour exam ● Open Notes ● Will mostly cover material since Exam 2 ● No, You may not take it early. Symantec AntiVirus Update Mark Reynolds Manager of Support Services Technology Support Services Michael Satut Manager of Distributed Support Services Technology. Malicious Attacks. 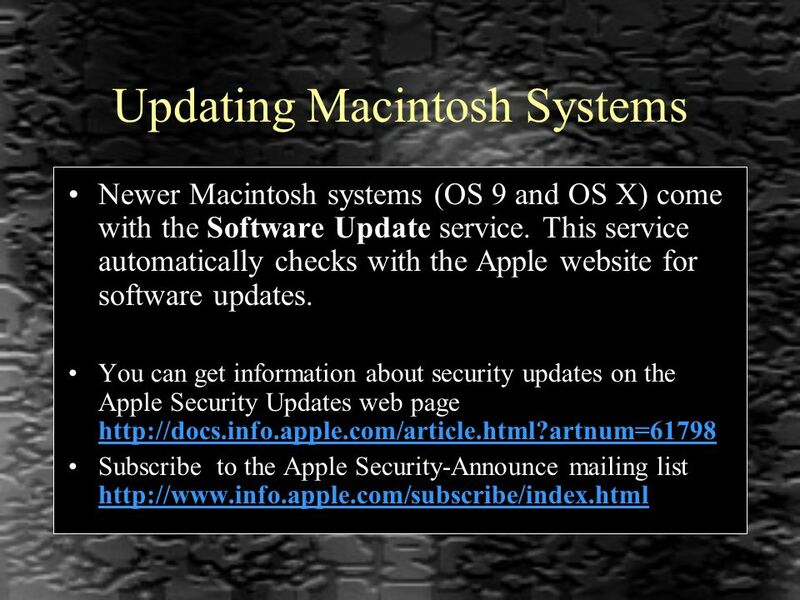 Introduction Commonly referred to as: malicious software/ “malware”, computer viruses Designed to enter computers without the owner’s. MCT260-Operating Systems I Operating Systems I Managing Your System. IT:Network:Apps.  Security Options  Group Policy  AppLocker  ACL. 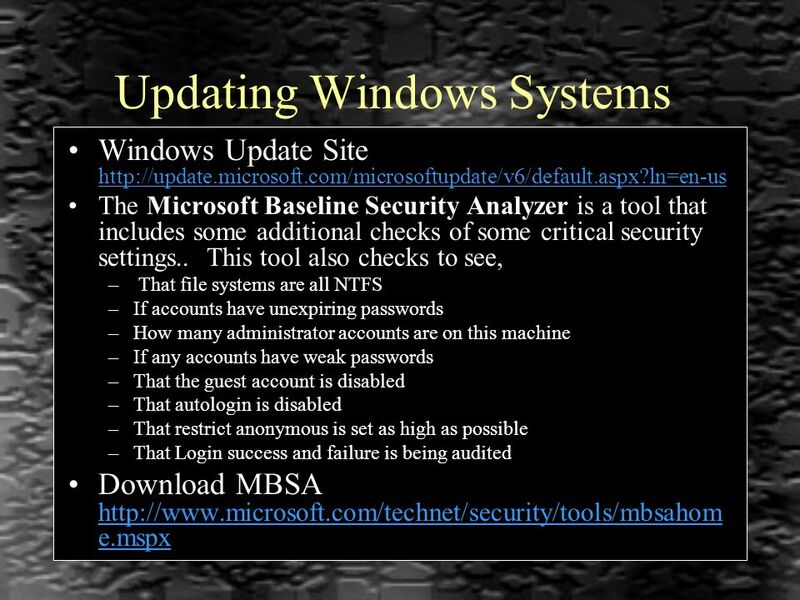 Windows Vista Inside Out Ch 10: Ch 10: Security Essentials Last modified 9-17-07.